Lock in a great price for Hotel Boutique Villa Venecia – rated 9.3 by recent guests! Liked everything about the hotel, staff were exceptional. Lovely hotel with friendly staff in a great location. 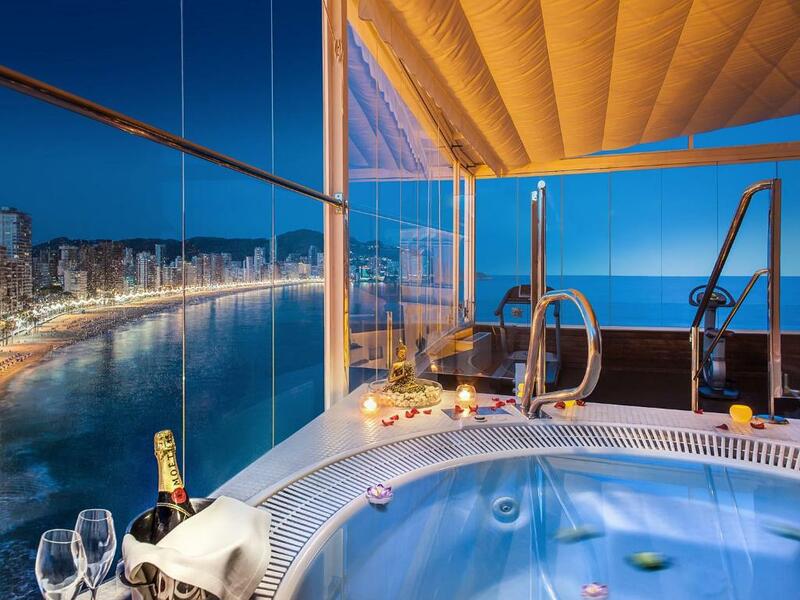 Nice room with big windows and a bath as well as a shower. This is our second stay and this year we had a kettle and tea as well as a coffee machine. Last year we had to pay for the coffee in the room but this year it was free. Breakfast was fantastic with a great variety. Fantastic hotel .. amazing service and food Spectacular sea views So impressed we are going back later in year .. 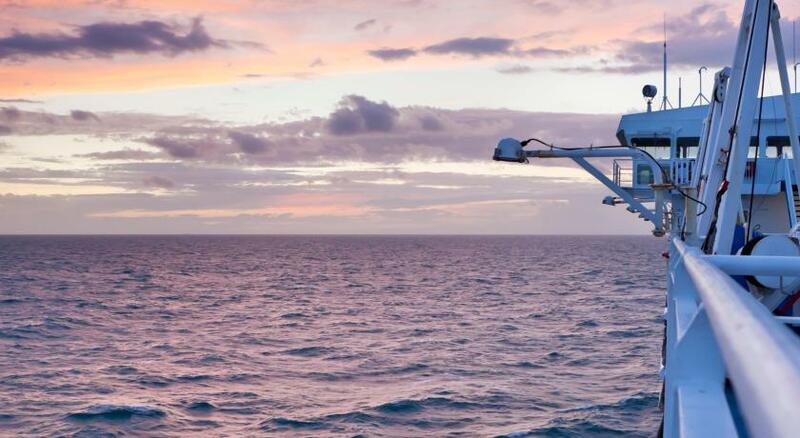 Excellent location with a great view! Very friendly and helpful staff! Lovely hotel in a lovely setting. Staff all very friendly. Fabulous room with stunning sea views. complementary chocolates every night, complementary cava at breakfast and a small bottle left in the room on our last night. Bed very comfortable, plenty of hanging space and drawers for clothes. Hotel Boutique Villa Venecia This rating is a reflection of how the property compares to the industry standard when it comes to price, facilities and services available. It's based on a self-evaluation by the property. Use this rating to help choose your stay! 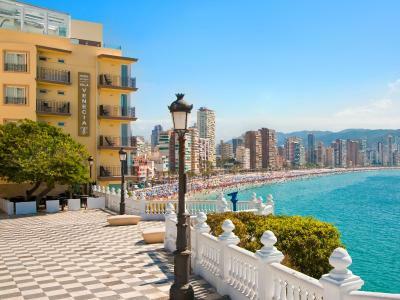 Located next to Levante Beach in Benidorm Old Town, Villa Venecia Hotel Boutique has a terrace with a hot tub and spectacular sea views. Rooms feature a flat-screen TV, hydromassage bath and free Wi-Fi. 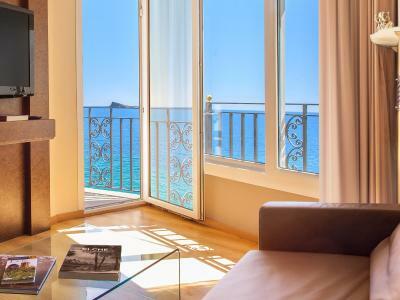 Each elegant room at Villa Venecia Benidorm offers panoramic views of the sea and town. 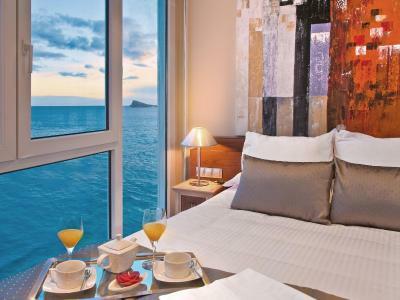 Rooms include designer furniture, a Nespresso coffee machine and a choice of pillows and mattresses. 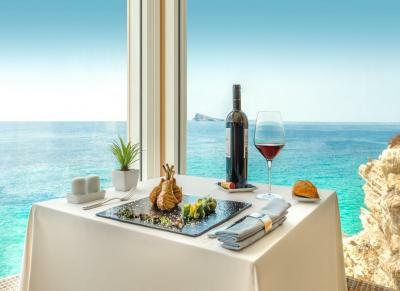 The Villa Venecia's Llum del Mar restaurant serves creative Mediterranean cuisine from local produce and fine wines from around the country. 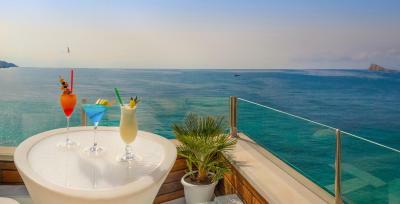 The hotel also has a stylish bar with terrace. 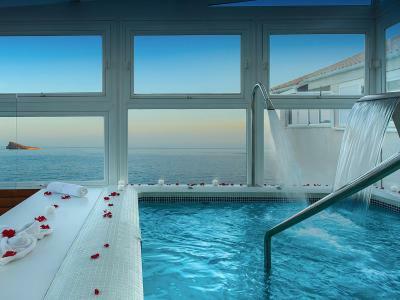 The hotel’s small spa includes a sauna, gym and Hammam, while massages are available on request. 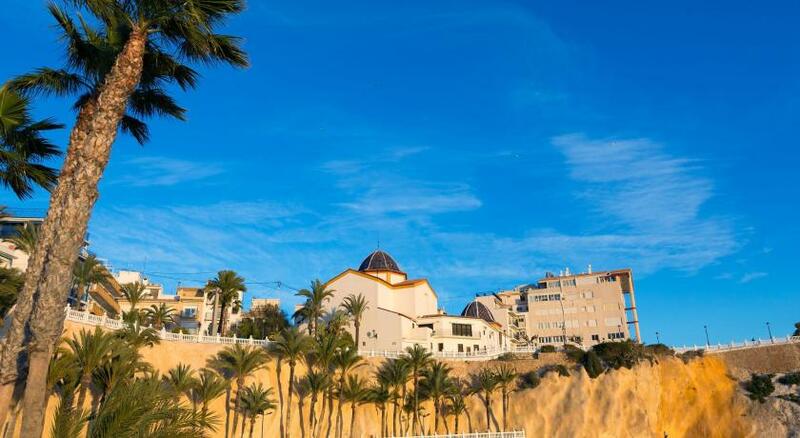 This property also has one of the top-rated locations in Benidorm! Guests are happier about it compared to other properties in the area. When would you like to stay at Hotel Boutique Villa Venecia? 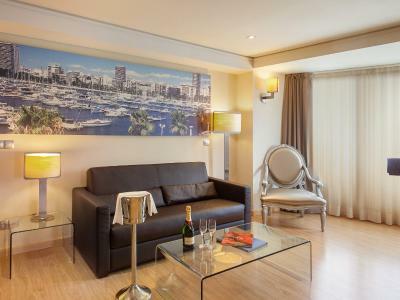 This larger room has panoramic sea views, designer furniture, a flat-screen TV and a Nespresso coffee machine. The bathroom includes a spa tub, bathrobe and slippers. 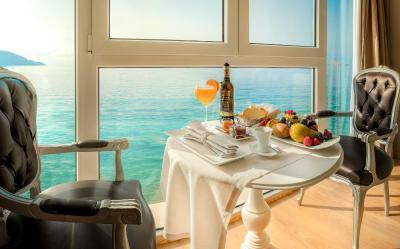 This air-conditioned room has sea views, designer furniture, a flat-screen TV and a Nespresso coffee machine. The bathroom includes a spa tub, bathrobe and slippers. This spacious suite has a separate lounge with a 40-inch flat-screen TV and a PlayStation. Rooms with a balcony are available upon request. 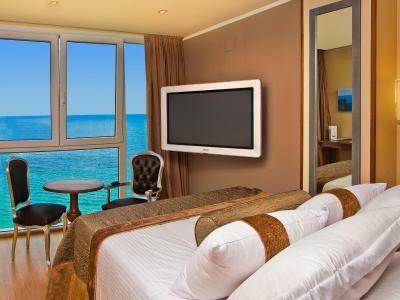 This air-conditioned room offers sea views and a flat-screen TV. This single room has a mini-bar, spa bath and air conditioning. House Rules Hotel Boutique Villa Venecia takes special requests – add in the next step! 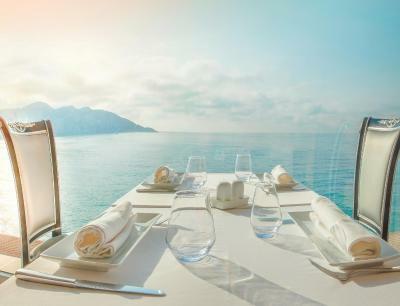 Hotel Boutique Villa Venecia accepts these cards and reserves the right to temporarily hold an amount prior to arrival. Please note the published rates for half board stays on 14 February, 25 and 31 December include a mandatory fee for the gala dinner held on those evenings. When the jacuzzi bath was turned on there was lots of black dirt floating around. Also the shower was leaking cold water which dropped down onto you when trying to have a hot shower. The hair dryer also cut out after 60 seconds at most, and needed time to cool down, so it took a long time to dry my hair. Also, there were works going on in the room next door. When we were checked into the room the receptionist said it would be finished within a few minutes, but the hammering continued for the 2 days we were there. Everything, the hotel, location, staff & rooms were excellent. A very enjoyable stay. It is getting a little tired. Extremely friendly and helpful staff. Great location. Lovely boutique hotel. Very difficult place to get to by car. Bed was small and noisy. fabulous breakfast. Great views,nice but small spa and pool area,although did have to keep calling the maintenance Man to switch it back on as it seems to be on a timer. The room is very small. The hotel is situated in the city center on the top and it was very difficult to get there by car. There is no private parking. The hotel offers to park in the neighbor hotel for fee but it takes 40 minutes for the driver to get the car from there. Very good breakfast - you can chose from the menu the desired courses. The view is perfect. Hard to get to the hotel by car. 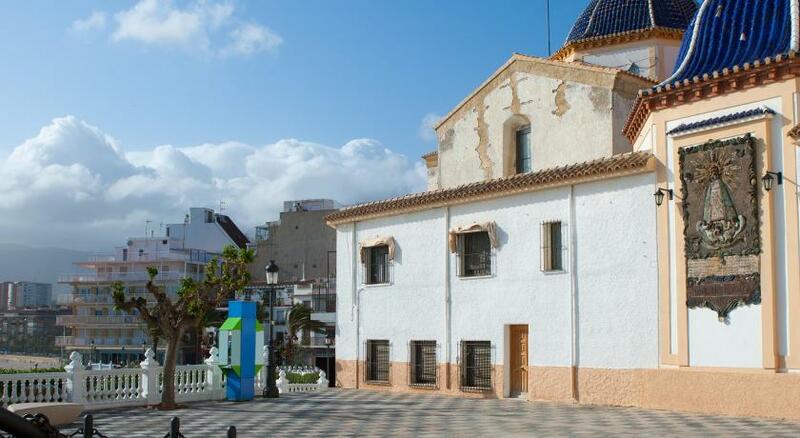 The location is perfect, close to the old town. 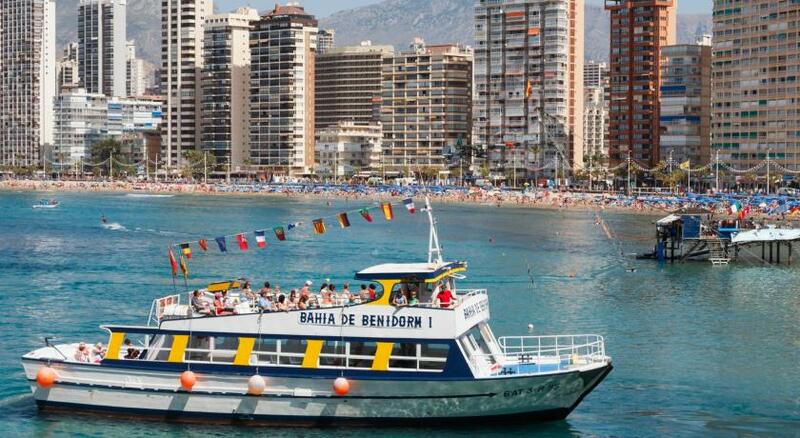 Rather ugly Benidorm from the window of this hotel seems fantastic. No complaints to report in this section. Breakfast was very enjoyable with plenty of choice and good presentation. There was nothing that we didn't like about this hotel or our stay. Check-in was most welcoming with a glass of Cava. We were accompanied to our room by the Receptionist and shown how to use the facilities and where to find everything we needed. The quality of our suite was outstanding. 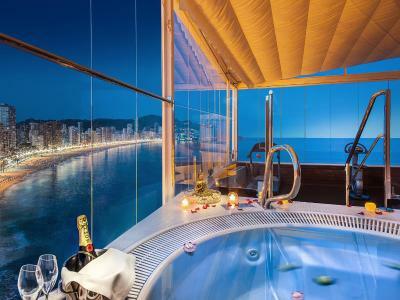 The other hotel facilities such as the pool, Jacuzzi, steam room and gym equipment were all located at roof level offering brilliant vistas over Benidorm. Memorable sea view with sunrise over Med. Excellent breakfast served outside. 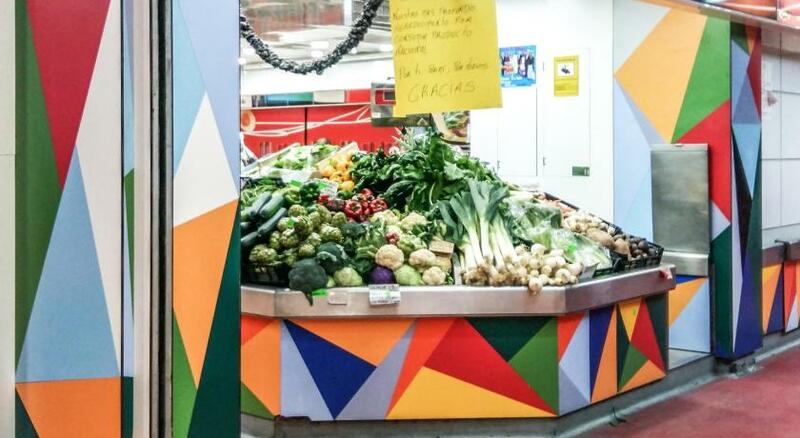 All staff were extremely helpful and polite, providing a very personalised service. The location was superb in the Old Town with many traditional Spanish Restaurants and Tapas bars within easy walking distance. 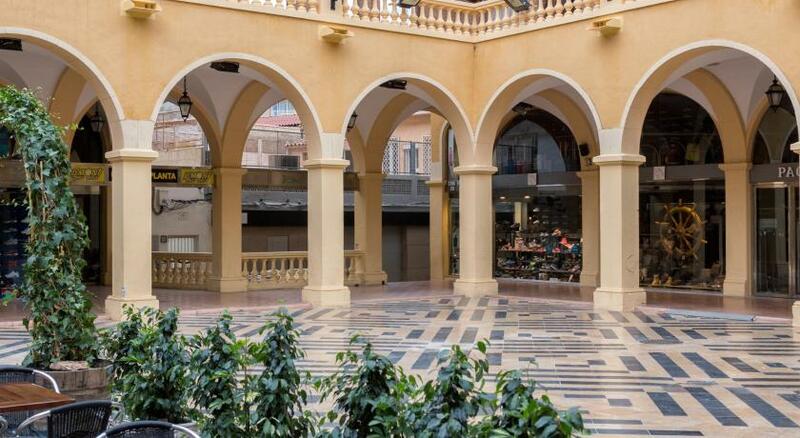 The adjacent tourist attraction of the Balcon del Mediterraneo, with musicians and cafes, has a relaxed atmosphere during the day. The Tourist Information Centre is also very close. 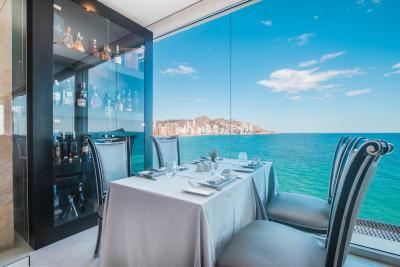 Overall, a luxury hotel in an endearing part of Benidorm.